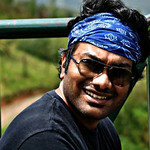 Vimal Abraham is a Chennai based amateur photographer, blogger, long distance runner, and a traveler with a wanderlust. When not traveling, writing or fidgeting with his camera, he runs the marketing strategy for a mid-sized technology brand. Pursues photography only as a passion and currently doesn't take up paid assignments.